The Sabres tried an interesting experiment in the past few weeks. They let the fans determine who should be portrayed in a bobblehead that will be given away at an upcoming game. The Final Four apparently was determined by an online fan vote, and they consisted of Dominik Hasek, Gil Perreault, Rob Ray and Pat Kaleta. Then at games, fans were asked to cheer for their favorite. The eventual winner was Hasek, who will be saluted with a toy in his image on April 4. I probably could have guessed that the two best Sabres in history, Hasek and Perreault, would be in the Final Four. Ray has the advantage of a long career as a player that helped him become a broadcaster. Kaleta is a local product, although I’m surprised Pat LaFontaine didn’t make the cut. As for the winner, I guess Hasek has the advantage of being the more current player and thus is remembered by more fans. After all, Perreault retired more than 30 years ago – which means anyone under 40 doesn’t remember much about him on the ice. But, I would bet that either of them would have lost to Rick Jeanneret – a man who crosses all generations of Sabre fans. The “contest” can be taken on a tangent to discuss an interesting question: Who is the greatest Buffalo Sabre of all time? Perreault and Hasek are the only candidates in that discussion. You know the basics. Perreault was the team’s original No. 1 draft choice in 1970. It was hoped that he’d be another Jean Beliveau, and he came very close to exactly matching the statistics of the Canadiens’ star with 512 goals and 814 assists. Perreault also was one of the most exciting players of his time, and brought attention to the Sabres to their early years. He stayed through 1986, finally retiring when most of his contemporaries were long gone. Hasek didn’t begin or end his career in Buffalo, but he made his reputation here. The goalie came from Chicago in a trade, took advantage of an opportunity when Grant Fuhr was injured, and never looked back. Hasek won two Hart Trophies and six Vezinas here. Like Perreault, he was only able to lift his team to one Stanley Cup final, losing it too, but no one blamed him for that. If he hadn’t spent his early days playing for unseen teams in Czechoslovakia, he might be universally acclaimed as the best goalie ever. OK, so they were both really good – Hall of Famers, of course. But who is No. 1 on the list? To me, it comes down to what you value in such a discussion. Baseball writer Bill James once wrote that there are two ways to value an athlete – peak value or career performance. That struck me as exactly on target. In this case, the answers are obvious. From a Buffalo Sabres’ standpoint only, Perreault had a better career. He stayed longer, was productive throughout his time here, and was crucial in the franchise’s history. If Dale Tallon (the No. 2 overall pick that year) comes to Buffalo in 1970, our hockey history looks quite a bit different. But no one ever said Perreault was the best player at his position in history. Hasek can make a great case for that distinction. I’d take him over Jacques Plante, Terry Sawchuk, Glenn Hall, Patrick Roy, Ken Dryden, or Martin Brodeur. His brilliance in the late 1990s with Buffalo may never be equaled. What’s more important in the discussion? Let’s put it this way – if I worked for the Sabres and had to order bobbleheads with the title “The Greatest Sabre of Them All,” I’d pick Perreault. Longevity tops peak value for me in that case. 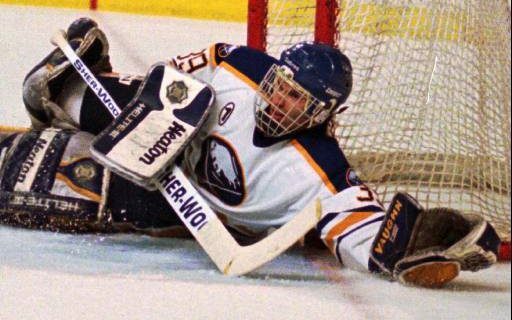 It’s a different discussion than who would be my first overall pick in an all-time Sabre fantasy draft, because that would be Hasek. It’s close enough to start a good argument with the hockey fan in the next seat at the KeyBank Center. Who would you choose? BSP Pro members can comment and give their opinion. If you’re not a BSP Pro, join now.